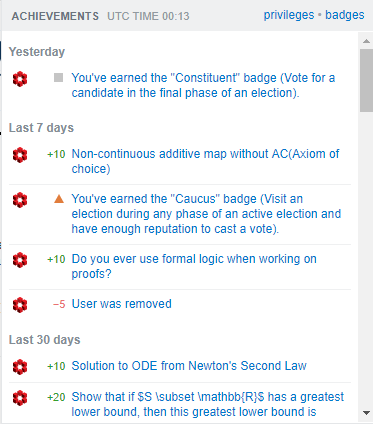 So the election for a new moderator are at the last phase and after reading what the candidates have to say I voted, and so I got Constituent. It is the first time I see this, so maybe there is connection between the two but I really have no idea. Our aggregation queue got jammed up with a bad item here (and we'd rather stall that discard data since it's terribly expensive to analyze and fill gaps after the fact). The bad entry has been handled (data wider than the column in 1 path) and we're now draining. Since we were at 2.25 million items it'll take 10-20 minutes or so to drain out. Once that happens, everything should be back in place. I often do not see reputation changes around the time of a User was removed message. As I also had reputation changes this week which did not show up, and had a User was removed with -85 reputation, I think this may be the explanation. I believe the site is programmed to suppress reputation change notifications if the total change is negative. For example, I sometimes see a $+8$ notification when there was a downvote, followed by an upvote, but the initial $-2$ does not generate a notification. For your case, however, it looks like the total change was positive, so maybe the conditions for notification are more complicated than I thought.